Works with Projectors and other Devices with M1 Connectors! 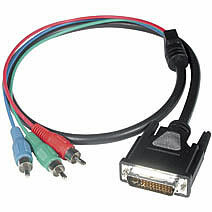 M1 cables (also known as EVC or P&D cables) work with projectors and other devices with the new universal M1 connector. M1 can carry both digital and analog signals as well as USB. Many new projectors on the market utilize this new technology to provide the flexibility of connecting to either VGA or DVI inputs. The M1 to Component RCA cables are perfect for connecting your projector or other M1 device to your DVD player or other component video devices!